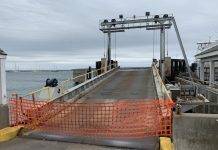 New gates are in place, and starting June 1, Martha’s Vineyard Airport unveils its new system for parking in the airport’s parking lots. The airport used LAZ Parking to install the technology, which features a colorful digital display, barcode ticket readers, and the ability to pay for parking using a credit card. Customers can also pay for parking online or with a mobile phone. Vineyard airport manager Ann Richart said she thinks the “honors system” the airport has been using to collect revenue for parking often gets abused and taken advantage of. “Parking revenue is one of the main incomes for airports,” said Richart. “We have had paid parking at the airport for years. 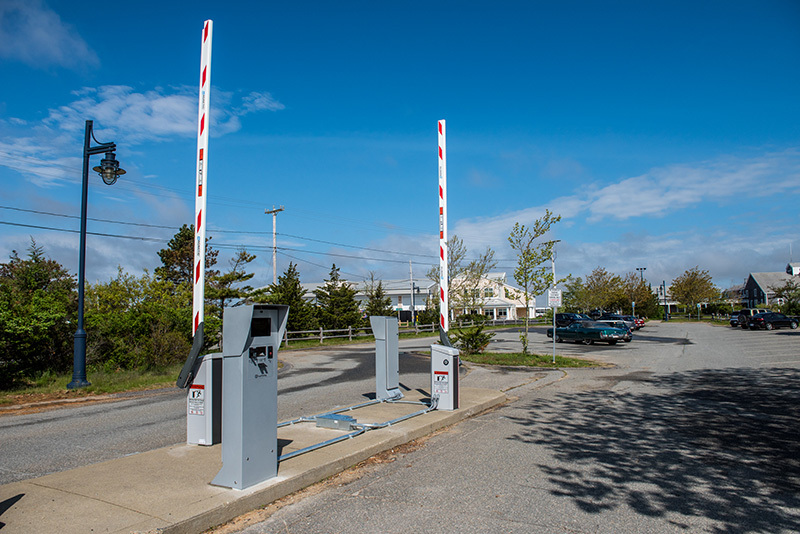 If someone parks over night, we leave an envelope on their windshield asking them to pay us.” Richart said the new parking system will ensure everyone is paying their parking fees and the airport is receiving much needed revenue. Mike Mihalow, director of business development for LAZ Parking, told commissioners at an April 12 meeting that he looked at neighboring Nantucket to set parking rates, and Vineyard rates still remain cheaper. Nantucket’s fee is $20 per day, according to Mihalow. Mihalow and commissioners also looked at Steamship Authority rates, which include a $50 fee. Original parking rates will be unchanged, including the first three hours of parking being free year-round, as well as regular seasonal rates from $15 to $20. An Island discount rate will still be offered for $10 for year-round residents. If a customer is visiting the restaurant or the ATM, they can simply pull a ticket and scan the barcode upon leaving the lot. The ticket will read $0 (if less than 3 hours) and the gate will open. LAZ will also provide on-site parking staff during the busy season to help with traffic and inform those who don’t know how to use the new system. If an attendant is unavailable, customers can request assistance by pressing the “help” button on the parking machine, and it will connect them with LAZ Customer Care Center, which is available 24/7. Richart said the interactive technologies and on-site attendants being implemented at the parking lot will help customers feel comfortable if they ever have an issue. The residents and visitors will adapt to the new parking system in time. The new system will correct and minimize inefficiencies in the collection of revenues for the airport. Customers will like the three-hour grace with parking, this is very generous, I’ve never heard of that before. With the initial costs to put the system in and then the operating costs this is hardly going to show a profit for the airport. The manager of the airport is out of touch. 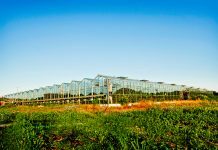 There are around 100 parking spaces that will generate income and the Martha’s Vineyard airport is not a departure airport. Most of the cars that are parked here are long term and already pay with a permit. So is it worth the expense to capture such a small amount of other vehicles. Probably not. The old system had flaws but no overhead. Each time the manager comes up with a new idea it seems as though she has no clue about the airport she is in charge of. And why doesn’t the commission do it’s job and ask the questions that need to be asked.